Petite Impact: Store Visit Try Ons! Be Present Scarf, Free To Be Zen Bra, Outrun Tight, Wunder Under Crop! Store Visit Try Ons! Be Present Scarf, Free To Be Zen Bra, Outrun Tight, Wunder Under Crop! Went to the store yesterday and first thing I noticed at the store is this gorgeous Be Present Scarf. It is super soft to touch, but I think it's too big for a petite person like me. It's meant to be worn as poncho or wrap but I'm still tempted to get it anyway because the color is bright and will pop against dark fall outfits. They also have this in a black & white version, not as fun though. I love the mini obscurred print so I was hoping to find it in the Free To Be Wild bra but instead we have it in the Free To Be Zen bra. The back is super strappy and while my normal size fit, the straps gave me too much back fat for my liking which I'll decline to show you a photo of lol. Next up, I saw the store had the new print power luxtreme spray jacquard in the Outrun Tight and they had my size. I know a lot of people are super curious about this print. There is some texture to the fabric. In the close up photo, it looks almost flaky. I honestly don't know how to describe it. This pair is made of Luxtreme and it isn't super smooth like you're normally used to. Look wise, I wasn't crazy about it especially with all the lines everywhere. I think there's too many seams and honestly the mesh was kind of scratchy on me. The mesh on these come up very high, they start around mid thigh and go all the way down to your calves. I'm also super short so I can imagine these would hit even higher up on the thigh on taller folks. Look! I remembered to put on my sneakers. ha! I forgot to do the bend over test I was so distracted by everything going on! 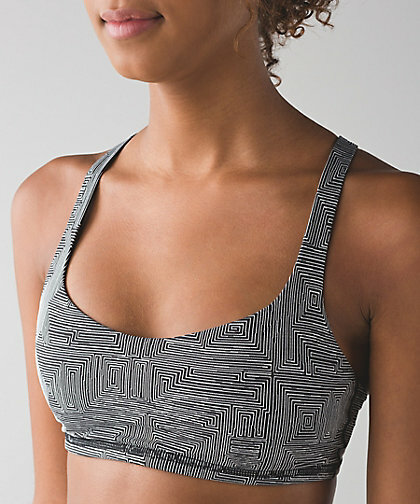 Next up I tried on the Wunder Under Crop in Maze Jacquard. These felt amazingly thick and soft. I love how they feel and would be so cozy for fall/winter. It's too bad they didn't look better on me though. While these fit like my other Wunder Wunder crops, the one thing I noticed that was very different was the ankles. These flared out a lot. It gave me the baggy ankle syndrome like nobody's business. If I got these, I would have to easily chop off 5-6 inches for the to fit normally around my calves. Otherwise the fit was true to size. Super baggy ankles! Ugh they look like high waters on me! 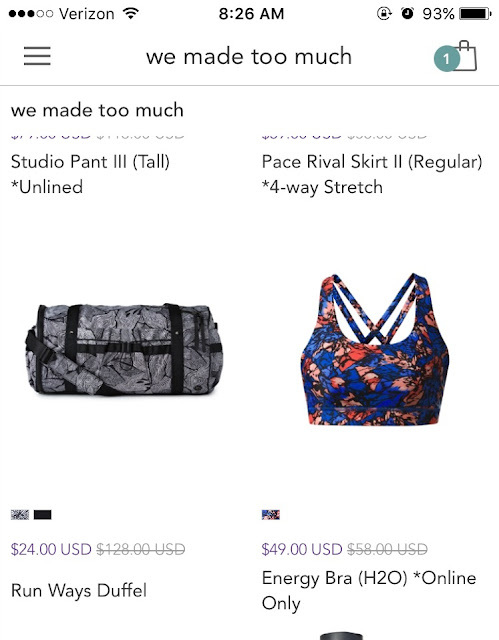 So while I loved the fabric and feel, I didn't find them flattering on me at all. I'm hoping to get this print in something else, like maybe this Free To Be Bra. Btw I happened to catch this while browsing the WMTM section early yesterday morning. Unfortunately when I clicked on the link it was back to $89. Otherwise I would have totally bought one for $24! Oooh lucky, what did you get? I got a couple of 5 miles ls and energy bra exhale. Bra was only $19. So happy!! Wow that's a great deal on the bra!